Also Recommended: Maria Watches Over Us, Blue Drop. Notes: Based on the manga by Takako Shimura, serialized in Ohta Publishing's Manga Erotics F manga magazine. Her father’s job transfer brings Fumi Manjome back to the town where she grew up, and she soon reconnects with Akira Okudaira, a childhood friend. 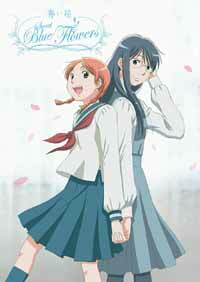 But Fumi soon finds a romantic interest in Yasuko Sugimoto, a popular, athletic girl at her all-girls’ school. This principle seems to apply to this series. Fumi is very dependent on relationships with other females. Very, very dependent. When we first see her in the series, she’s in a passive-aggressive snit because her cousin Chizu is going to “betray” her by getting married. I very much got the impression that whatever was going on (or not) between her and her cousin, Fumi was DEFINITELY the one more dependent on the relationship. Here’s my problem, and PLEASE STOP READING NOW IF YOU DON’T WANT TO KNOW HOW THE STORY GOES, though I hope it’s not really too much of a spoiler to say that the deck will somehow be cleared of Yasuko (check Bradley’s review), and that therefore Fumi and Achan will be together in SOME capacity; we’d pretty much expect that to happen. My problem was I never really got the feeling that Achan’s feelings toward her relationship with Fumi were…well, of the same kind as Fumi’s feelings toward relationships with girls. We are shown that Achan hasn’t had much experience with romantic relationships at all, and hadn’t really thought about one with a girl, though she’s not necessarily averse to one. I couldn’t help feeling that they would inevitably expect very different things from each other- Achan coming at this from the “best friend” orientation, while Fumi maybe seeing Achan as yet another “rebound” romantic relationship- and I wanted to see how they worked through these differences (or for that matter if they even did.) Who wants to just see the opening act of a potential romance without the developments that follow- especially if the romance, if it develops at all, will inevitably involve some interesting complications and adjustments? The series is a bit short- only 11 episodes- and I think another episode or two of followup would have brought me around to giving it 5 stars as well. Still, there’s plenty of wonderful stuff here. The characters are all vivid, though not always pleasant (and SPEAKING of the Sugimoto Sisters, I noted that Shinako Sugimoto was voiced by Mamiko Noto, and she’s so good at delivering icy sarcasm that I wish she took more roles like this rather than the “sweet” types of characters she usually plays.) The closing song, “Centifolia”, is beautifully simple, and simply beautiful. The three “sidekicks” were a delight, especially in the camping-trip sequence, and I also liked the ambivalent Kyoko.